This accessible and engaging book gives parents a grasp of what the Bible is (and is not), and helps them communicate its truth to their children faithfully, powerfully, and with joy. 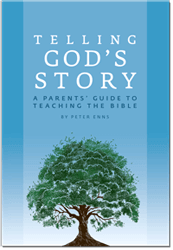 Peter Enns (author of the popular NIV Application Commentary on Exodus) provides parents and teachers with a straightforward and intelligent plan for teaching the Bible. Beginning with the Gospels to introduce the youngest students to Jesus, Enns suggests continuing on to the more complex stories of the Old and New Testaments for middle grade students, and finally guiding high school students into a vital understanding of the history and culture of biblical times. Telling God’s Story is designed to help parents as they encourage their children to become mature, knowledgeable, and humble followers of Jesus. I am going to to use “Telling God’s Story” with my granddaughter. Will I need both the Parent’s guide and the Instructor text/ parent’s guide text book? The “Parents’ Guide” (with the tree on the cover) is useful but optional. The best things to have are the Instructor Text for whichever Year you are doing, and the Activity Book (“student guide and activity pages”) for that year. We are starting to homeschool our daughter at the 4th grade level. I am now in search of next year’s curricula. Telling God’s Story is intriguing but we will not be homeschooling for the full 12 year cycle. Is this series set up as a “stand alone” or do you have to include all 12 years in your study cycle? It’s certainly a stand-alone. You can do it for one or two years, or four. You don’t have to commit to doing it for several years.